Steak is one food that is guaranteed to bring a smile to my dog’s face. When our friends at Chewy.com sent over some dog treats made from real sirloin steak, I knew Sadie would be excited. When you have a picky dog that needs to be coaxed and encouraged to eat anything, it’s a wonderful feeling to find a dog treat that your dog will eat immediately, without hesitation. 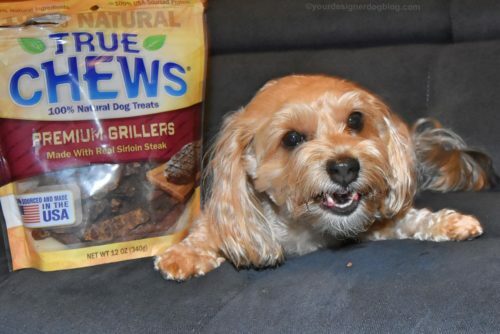 And True Chews Premium Grillers are exactly the treats I need to make my dog’s mouth water. 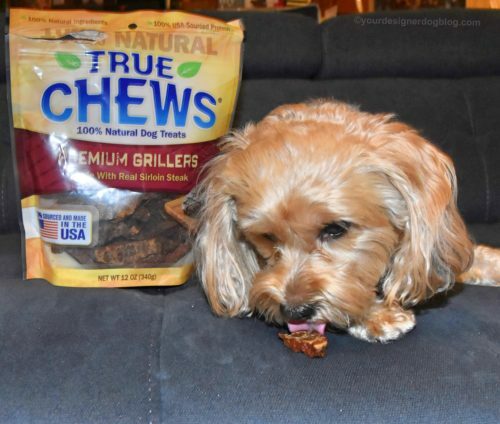 True Chews Premium Grillers are the perfect form of enticement for Sadie. As I explain in our book, How To Get Your Dog To Eat (Chapter Four), sometimes my dog doesn’t find her dinner interesting enough to start eating. She’ll smell her dog food and then walk away, hoping for something more exciting to eat. That’s when I can use True Chews Premium Grillers. I take one of the treats and break it up into small pieces, which I sprinkle over Sadie’s dog food. Since she can’t resist the steak treats, Sadie will eat her whole dish of dog food just to get at all the little pieces of the True Chews Steak treats! The beef used to make True Chews Premium Grillers is sourced entirely from American farm-raised cattle. 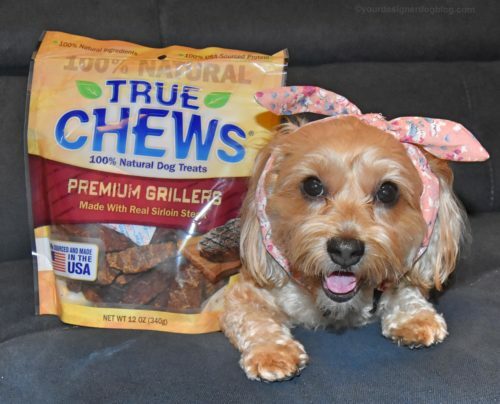 These treats are all natural and made in the USA without fillers, by-products, grain, artificial flavoring, or preservatives. The sirloin steak is slow roasted to give your dog that great tender grilled taste. There are two flavors of True Chews Premium Grillers, beef and salmon. 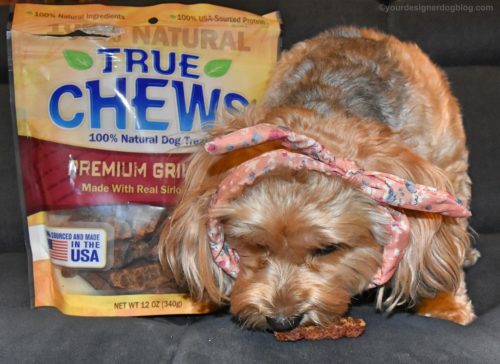 True Chews also offers two flavors of Premium Jerky Cuts and two flavors of Premium Sizzlers. 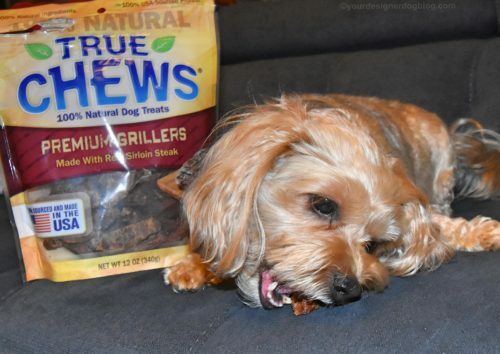 All six varieties of True Chews dog treats are available at Chewy.com starting at $9.45. This post is part of the #ChewyInfluencer blog hop. I received a free bag of treats from Chewy.com in exchange for an honest review. All opinions are my own, based on my experiences with this product.